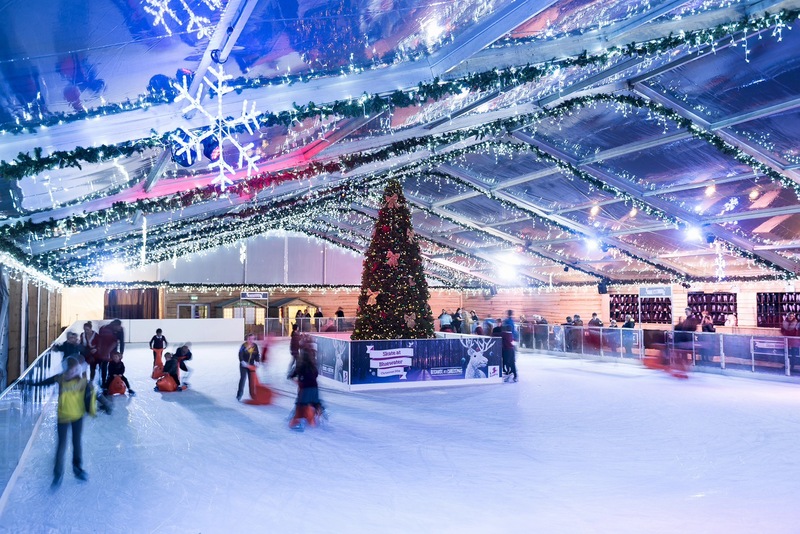 Bluewater is one of Europe’s leading retail and shopping destinations and have used Icescape to provide their annual Christmas ice rink for the past three years. The ice rink is nearly 600 sqm and has a large Christmas tree beautifully decorated in the middle. With our experience, expert team and proven track record, we were more than happy to fulfil our clients’ request of delivering the highest quality skating experience. 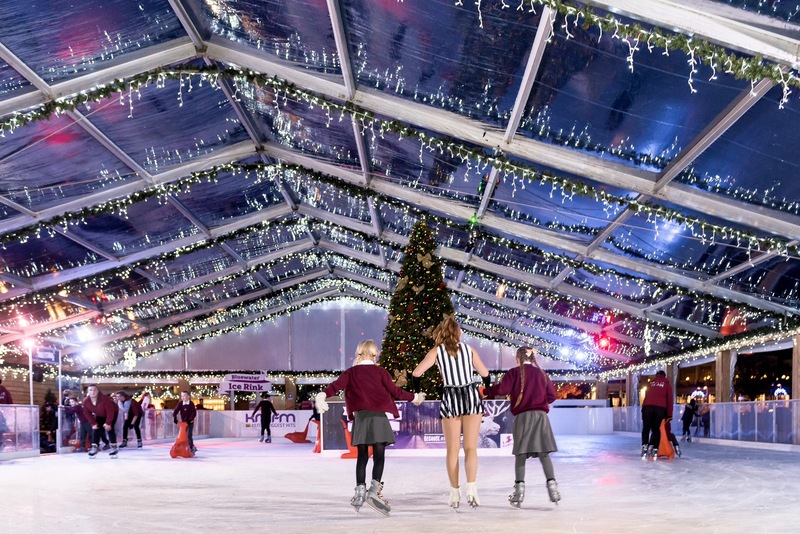 The rink is housed inside a 25m wide marquee with transparent roof panels provided by our sister company, Danco Plc. Even when it rains, the rink will be in perfect condition for all to enjoy. In addition to the real ice technology we supplied for this luxury rink, we were also happy to supply other packages including accessories and temporary structures. Over 400 pairs of hire skates were stored in the wooden skate exchange which we built on the side of the rink. Six ‘alpine lodge’ style concession structures were also installed, with two extra wooden structures used as a first aid room and staff room. A PA system, decorative lighting and frosted garland were also supplied throughout the structure. At the end of the rink was a raised platform with picnic benches offering customers an excellent view of the ice rink and a great place to enjoy some delicious festive food and drink. Icescape also supplied solid wooden benches for the skate exchange and fully clad some of the internal walls of the marquee in wood panelling to provide the most realistic Alpine finish. One of our fleet of state of the art resurfacers were also present on site to ensure the skating surface was kept up to the highest standard. This was hidden in its very own secure bay with wood panelling. The build time was close to two weeks and due to the lakeside location and as an extra environmental precaution, all the cooling plant equipment was double bunded. Our specialist equipment ensures we remain at the highest standard in skating experiences at any location. We pride ourselves on giving all customers who visit our rinks the best experience possible, and Bluewater is no exception.